A mechanic I know at a nearby full-service shop just purchased a pretty monstrous tool chest. It’s 53” wide, has sixteen drawers, and cost around $1900. Pretty standard fare, until you get to the part where it has a built-in refrigerator and a stereo compatible with an MP3 player. The asking price isn’t bad, but this blurs the line between tool box and lifestyle statement in this writer’s mind. Call me old-fashioned, but I have trouble seeing the point of all this. My idea of a high-tech tool storage innovation is foam-lined drawers; speakers and a fridge make this box seem like some kind of social center rather than a storage system, but maybe that’s exactly the point. So, the question is, hot or not? Let us know in comments. I think its awesome, but i would prefer the extra storage, but i already have a full size fridge/freezer and a stereo in my garage. NOT – these gimmicks are almost never worth it – Never buy a product that can’t decide what it is. Toolboxes last for generations. When the fridge dies or a speaker craps out, you’ll be left with a toolbox that has valuable storage space given over to useless broken gadgets. Buy the stereo and fridge separately, they’re about $100 a pop, and if you’re good enough with the contents of your toolbox you can mount ’em wherever you want. The only two technologies that have ever been successfully integrated are the clock and the radio. maybe it’s not just me, i think not as well. here is my theory it’s sort of like new work trucks that you can’t buy, because they come with too much crap to really need, but if you need to add gimmicks to sell your wares then maybe your wares are not up to par to begin with. i’m sure an equivalent Snap on tool box would run you a damn site more and not have the B*** S***. so it make you wonder did maybe they throw crap onto a crappy product to try and make it have more appeal?? NOT – but I can see why they did it. I do have a fridge and a stereo that I hook up my Ipod so technically there is a market for it. If somebody purchased it for me as a gift it would be AWESOME… but a 1.9k I’d have to be really good friends with Mr. Trump or something. i have a great idea for it, ok hear me out, modify the center drawer for an electric hot plate and use the storage for kitchen esstenial and you have a kitchen on a budget, my wife could get a kitchen and i could spend the surplus budget on more TOOLS!!. so you get a spot for a cutting board, and cutlery, big drawers for pots and buy those flat pans, if you need more cooking, well you are a man and must have a BBQ grill right??? and imagine your wife gets the stainless steel appliances she wanted too. and if she’s not happy she can blast her favorite tunes on the stereo, that will cheer her up right? if only there was a place for a sink! I don’t know about you guys but my work is noisy, filthy, and often outdoors. It’s too noisy to enjoy the radio most of the time and so filthy that appliances tend to go South for the winter. Work is hard enough on metal toolboxes, let alone electronic appliances. I say if you’re going to enjoy a cold drink, do it in a nice clean, quiet spot away from the work to get a break from the dust, compressors, generators, or what have you. Put your fridge/cooler in your lunch area; away from the work. To Lex Dodson regarding foam-lined drawere: Amen! A couple of old foam camping-mats can be cut out to give all of your toolbox drawers a nice french fit. I just can’t quit my bad habit of slamming my toolbox drawers; the fitted drawers stopped the gradual migration of tools towards the back of the drawer. 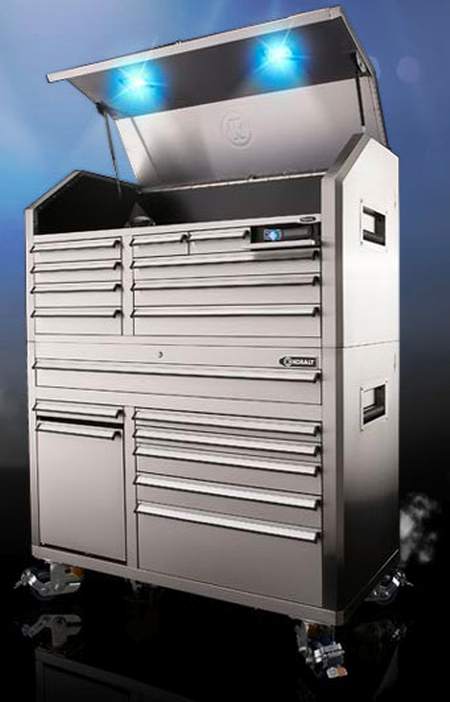 If you want to see monster toolboxes, check out Professional Tools and Equipment News (pten.com). There is a feature in their online magazine called Big Time Boxes where extremely large toolboxes are shown; often multiple boxes are bolted together to make a “wall” of drawers. The box featured in the October 2008 issue belongs to a dealership mechanic which has a DVD player with surround sound and a pizza oven. Each to his own, but just the same: Is there an emoticon I could use in the future to express my combination of disbelief and disapproval? NOT. Checked it out at Lowe’s. Looked like a pretty decent pro/serious amateur box….. till I saw the bells & whistles. You’d think they’d have learned from the Craftsman AXS blunder. Good points from everyone. I was expecting some frizz-chinned boy-racer type to show up and tell me stuff like this is wykid syk. I have seen these at three different Lowe’s in DFW. Every time I see one, the door covering the head unit is broken. The fridge is a dumb idea too. It is too small for anything but a six pack and I would rather have that space for tools anyways. Also, the ipod connector won’t work with newer iPhones and probably newer iPods. Apple changes the connector every so often so you are looking at a part that will be obsolete quickly if its not already there. They should have used a head unit that has a USB connector instead of a dedicated iPod cable. Rick, I thought the connector was the 3.5mm jack for headphones? That’s the only truly universal audio connector going these days. It’s a neat gimmick, but as mentioned above, the fridge is next to useless. The stereo appeared to be moderately decent, but really, any shop where you plan on relaxing should have at least a good bookshelf system. This doesn’t seem like an item portable enough to take out to a job site, and certainly not an outdoor one. The ones I’ve seen had an actual iPod connector. They could have changed it since I last saw it. I’m going to Lowes to buy some materials today. I’ll check the one they have on display. I like the idea of the radio/ipod setup but the fridge is a bit much. Also what is up with all the decent new boxes being stainless? That’s what really drives me nuts. Anyways, I stopped and looked at the toolbox. I’m right, it has an actual iPod adapter in the box. There is also a pocket to store your iPod and an IR remote control. Bob, however, is correct that there is also an AUX in for the head unit. But that is on the face plate. You have to leave the stainless steel cover down in order to use it. Also, that cover has to be left down in order to use the IR remote. Said cover is pretty flimsy too. I’ve seen many of them broken on the store display. I will say this though, it was a pretty well built box. Not nearly as rugged as a SnapOn box but if you are getting something like this or the other Kobalt toolbox mentioned earlier, I think you’ll find that they will serve your needs just fine. But if your a PRO or work NASCAR like FourMat does, I would stay away because durability is going to be an issue. I know FourMat has a “plain jane red craftsman box” but I’m willing to bet that he probably does a damn good job taking care of it. Most tool boxes will last if you just do that. I’ve got a Harbor Freight toolbox that I’m going to replace soon but after 5 years it is still in pretty good shape and I’m going to give it to my little brother. When it is all said and done, buy what you want. I don’t recommend THIS particular box for the reasons mentioned but there are certainly some decent to very good boxes to be had for a reasonable price. Not. This is a child’s toy bottom line. If you want to work, man up and get a real tool box that just holds tools. Re: New vs Old Ipod Adaptors. We ran into this with one of our vehicles when upgraded to the latest generation of iPod Nanos. There are convertor adaptors online that will mate your new iPod to your old adaptor. All features work fine, was about $30 inc shipping. Found it through Amazon.com I believe. I would have bought a new adaptor cable for the stereo in that car, but one wasn’t on the market yet. Last time I was at the dealership in the service waiting area I watched a stream of techs walk in to hit the soda machine. Now knowing that time=money for service techs maybe this would save them trips inside for a drink and save money on the drinks themselves. So that means more time for work and less money spent on the snack machine. Would I buy one for myself at home? Absolutely not. I think not. I did have a mechanic who installed a car stereo in one of the drawers of his mac tool box. He powered it with a 12Volt wall wart. So there is something to it. I think he did it because it was a slow day. If the dealership had any sense they’d put a drink machine in the bay. Or supply their mechanics with free drinks. Or if as a mechanic you want to do it yourself then you buy a small, lockable refrigerator (aka a dorm fridge) for well under $100. I just happen to have one, i have also seen my buddies in the past make stuff like this. I work on airplanes and helicopters etc. and a lot of the time we have to use our own boxes. Now you can spend 6000 or so on a snap on box half this size or 1900 on one like this with the goodies on it. I always had to have a portable radio and then find a place to lock it up at night or with a cable. also had to carry an icechest lunchbox and hope they had room in the break room fridges for my stuff and hope it didn’t get taken also. now i have my stereo at my work sight, i have my fridge for my lunch and my drinks, snacks whatever and plenty of room for my tools and everyone is jealous. with their 4-6000 dollar matco/snapon basic roll-a-round boxes with nothing and mine has all the stuff they want. built in professionally not added on with built in electrical outlets for my fans etc too. I love this box. and oh yeah i have a standard waterloo. a 13 drawer snap on and a u.s. general harbor freight 13 drawer roll a round with the 11 drawer top box and a matco S&S limited edition tool box with all the matching lazer etched tools and tool stamped foam inserts from the factory. so I would say I have some tools and some knowledge and for the money. this is the best toy I have and everyone I know wants it. its over a year and a half old and everything still works great and looks new. so spend 1900 and save 2000 to 4000 from the other guys and buy more tools, lol. I’ve been a technician for over 20years now. I work in dealerships exclusively. I am not a flunky, i am very good at what I do. I have been amazed at the number of techs and mechanics that are purchasing small refrigerators to keep in their stalls and use to store bottled water, lunch, etc. I also am aware of all the guys who bring mp3 players and radios to work where they end up on a work bench and get ruined. Actually, I have to hand it to kobalt for thinking outside the box. Their ideas, based on my experience, are in keeping with the current “shop bay” trends and are good. I plan on purchasing one of these to store my own tools, or most of them. After all, $1900 is a drop in the bucket compared to what a comparable snap on costs. I also have to add, that very few of the guys I know in the business rarely ever purchase from snap on, or any of the big tool dealers anymore because their stuff has just gotten ridiculously over priced. Sears makes this same toolbox now, seems very handy to have built in music to save you from lugging around a getto blaster everywhere and the fridge seems ok, keep people from squissing your lunch at work. In a home garage? No way, just get a real stereo and a real fridge. You guys who hate these boxes must be getting paid a fortune. $4000 is a huge price difference. This is like complaining that a Korean hatchback just isn’t built to the same standards as a Bugatti. I personally would not spend huge amounts on a box (I wouldn’t buy the cheap rubbish either) because who knows what will be available in 5 years. I work in industrial robotics, I don’t know what tools I will need or what size they are. Gone are the days when you do an apprenticeship at 16 and retire in the same job. I believe that a regular update of your box is good for your moral too. As for the original question; I like the idea of a built in stereo and fridge. I would also like it if behind one of the plates they put in a power board, maybe a small personal air compressor or a thin full length cabinet to hand your overalls in at the end of the day.